US Vice President Mike Pence delivered a sanctimonious sermon in which he denounced Tehran for threatening a “another Holocaust” and attempting to recreate the Persian Empire by opening up a “corridor of influence” through Iraq, Syria and Lebanon. 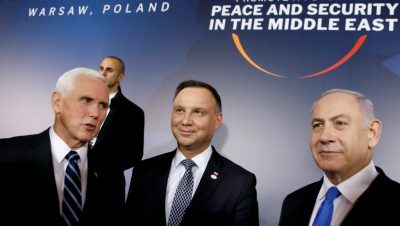 Outside of the UK, none of the European powers sent so much as a foreign minister to the Warsaw gathering, which was seen accurately as a US-sponsored rally for war against Iran. The EU’s foreign policy chief, Federica Mogherini, who participated in the negotiation of the Iran nuclear accord, also declined to attend.